An artist's illustration of the interstellar asteroid 'Oumuamua. The first known interstellar visitor to the solar system, 'Oumuamua, highlights how life could also spread between the stars, and perhaps even across the galaxy, two new studies find. 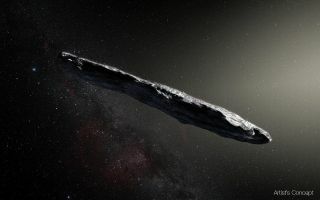 In 2017, astronomers detected a cigar-shaped asteroid named 'Oumuamua, or A/2017 U1, a chaotically tumbling 1,300-foot-long (400 meters) object whose trajectory suggests it may have come from another star, or perhaps two. Researchers since learned that 'Oumuamua is unlike anything seen in the solar system, varying in color across its surface in a way no scientists could at first explain. "Interstellar objects could potentially plant life from another planetary system in the solar system," Avi Loeb, an astrophysicist at Harvard University and senior author on both of the new studies, told Space.com. The group calculated the rate at which the sun and Jupiter together might gravitationally capture interstellar objects such as 'Oumuamua and found the largest body they could trap was a few dozen miles wide. They performed similar calculations for the Alpha Centauri A and B binary system and found it could capture Earth-size interstellar objects. The researchers also estimated that an interstellar object about 0.6 miles (1 kilometer) wide might typically strike Earth every 10 million to 100 million years. Such collisions might have helped deliver organic compounds or even microbes to Earth, they said. "Life can spread across vast distances," study lead author Manasvi Lingam, an applied mathematician at Harvard University, told Space.com. Lingam and Loeb detailed their findings from the first study online Oct. 12 in the Astronomical Journal. The scientists then explored how many rocky asteroids or icy comets ejected from one planetary system can get trapped by another one across the entire Milky Way. They accounted for the number of stars an interstellar object might encounter, the number of stars in the Milky Way, the distances between the stars, the amount of time it might take for an interstellar object to make its way from one star to another and the amount of time life might be able to stay alive. "Bacteria can survive for many millions of years for sure," Idan Ginsburg, an astrophysicist at Harvard University and lead author of the second study, told Space.com. "If the rocky body was large enough, bacteria would be shielded from most radiation, and when it entered an atmosphere, while the surface of the object would get scorched, inside microbes could survive." The researchers estimated that "if life can survive for a million years, there could be over a million 'Oumuamua-size objects that are captured by another system and can transfer life between stars," Loeb said. All in all, "life could spread throughout the entire galaxy through panspermia," Ginsburg said. In principle, galactic panspermia might not only bring life to lifeless planets, but spread one form of life to a planet with a different form of life, he added. Moreover, "in principle, life could even be transferred between galaxies, since some stars escape from the Milky Way," Loeb said. "These stars could potentially transfer life throughout the universe." Ginsburg, Lingam and Loeb detailed their findings from the second study online Oct. 10 in a study submitted to the Astrophysical Journal Letters.